Worship matters. We were created to be in relationship with God, in fellowship with Him, and to do so together with His people. The basic, bedrock promise of the Bible story from beginning to end is, “I will be your God, and you will be My people, and I will dwell in your midst.” Corporate worship at its best is the closest experience of that eternal reality we will experience in this life. Over time the most accurate insight into a church’s theology is their worship- what they do, what they sing, what they say, and the heart with which they do it. When you believe you are going to meet with God, you show everyone most accurately what you think about Him. Paul reminded believers to remember the basics: “It is no trouble for me to write the same things to you again, and it is a safeguard for you” (Phil 3:1). Matt Powell applies this principle in his book, presenting the basics of biblical truths in a straightforward and clear manner. 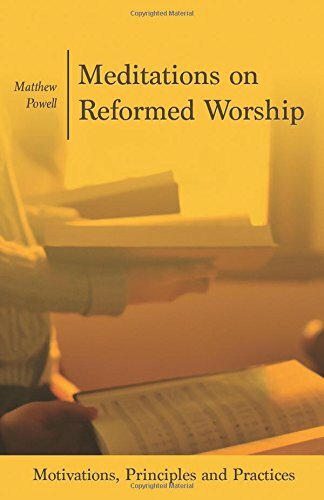 Whether you are reviewing the foundational teachings of Scripture for yourself, discipling a young believer, or teaching a small group, you will find The Essentials of the Christian Religion practical and usable. The Lord is There seeks to open up the prophecy of Ezekiel to the reader. This marvelous prophecy expresses the whole of the gospel in Old Testament terms, showing us why we need God’s grace and how that grace will be enacted in the lives of God’s people; how the grand purpose of God’s covenant promise of fellowship with His people is finally accomplished. Challenging, confronting and comforting, Ezekiel is an often neglected book that every serious Christian should get to know. The Lord is There will apply this ancient prophecy to the life of every believer.